This is the third year we’ve reviewed Magnum’s newest products. It’s always a pleasure to do so because Magnum is probably the best in the world. Well, I’ve been around the block a bit and I’ve not tasted better choc ices. In 2014, we tried Magnum’s 25th anniversary “Inspired by Crème Brûlée” ice cream. This was a limited edition, exclusive to Selfridges, created especially for the celebrations. Although our taste team didn’t think it was much like crème brûlée, we thoroughly enjoyed it. Next, in 2015, we tried Magnum Pink and Magnum Black. These were designed to reflect the playful and sophisticated sides of your personality. On a blind tasting, our team recognised the coffee flavour of the Black but thought the Pink was cherry rather than raspberry. We also came to the conclusion that we were more sophisticated than playful. That was fun! 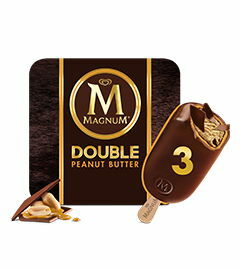 And now, in 2016, we’re delighted to try one of their latest flavours, Magnum Double Peanut Butter. Despite always enjoying the opportunity to try new Magnums, I had some apprehension about this one, having imagined eating a dollop of peanut butter on top of a scoop of vanilla ice cream. This didn’t particularly appeal. However, we’ve been pleasantly surprised before – Magnum ice creams are often not quite what you expect – so I was happy to give it a go anyway. Hmm. (And Mmmm.) Perhaps predictably, it wasn’t quite as I anticipated. First I bit into the Magnum’s cracking good chocolate, which was excellent as always. My first impression of the ice cream waiting inside was, “Oh. It’s not too sweet.” Of course I should have known better. After all, in our previous reviews “not too sweet” has been a recurring theme. Also, the peanut butter taste was quite subtle. If I’d not known it was peanut butter, and had done a blind tasting, it would have taken my full concentration to describe the flavour as “peanutty”. In my case, this was a plus point given that I hadn’t really fancied peanut butter ice cream anyway. Velvety peanut butter flavour ice cream enrobed in a chocolate flavour coating, followed by a luscious peanut butter sauce layer, finally wrapped in a layer of cracking Magnum chocolate. It’s interesting that they describe it from the inside out while we, naturally, eat it from the outside in. Mr Not Delia had a similar tasting experience to mine. The first thing he said was, “Good. It’s not too sweet.” He says he rather enjoyed it, though he wouldn’t necessarily rush out to buy one. Going back to the subject of blind tasting, I was not very impressed by the packaging. We had bought a multipack of three Magnum double peanut butter ice creams from our local Tesco. The multipack box itself quite clearly stated “peanut butter”, so no problems there. However, due to limited space in our freezer, I had taken the lollies out of the box and put them into the freezer whilst throwing the box away. Thus, when it came to tasting time I only had the lolly’s individual packaging to tell me what lolly exactly I had. Anyway, the result of this is that I had several different flavours of Magnum to choose from but the peanut butter ones only had “Dare to go Double” on the front and no mention of what “Double” it was. Magnum has several new “Double” flavours, including chocolate and caramel (see below), so it wasn’t at all obvious to me which flavour I’d picked out. Here’s a photo of the front of the wrapper of the peanut butter ice cream. I guessed they must have to list the ingredients on the wrapper so I turned it over. At first glance, it appeared to have no information. However, under the fold it did say “Double Peanut Butter”. It’s not a big deal, but I just felt it was a case of style over function. I would have preferred if the wrapper had stated the flavour on the front, or even a bit more obviously on the back. 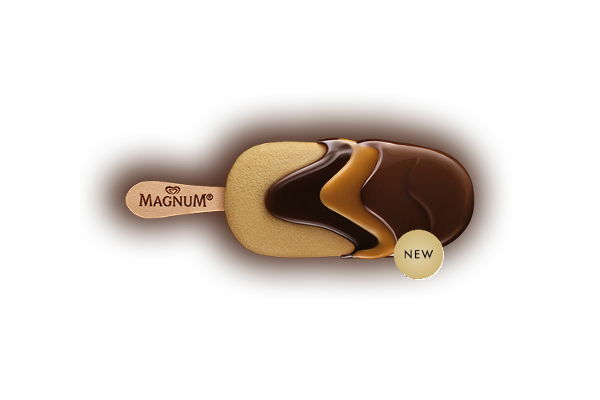 Magnum, the authority on pleasure, today announced the long-awaited return of its most indulgent range, Magnum Doubles. The selection comes roaring back with more splendour than ever before and, tapping into taste sensation trends, the range now features a decadent new Peanut Butter flavour to add to its premium collection. Each flavour is designed for those moments of pure luxury, and is inspired by the part of our personalities which seeks to make every moment of indulgence count. 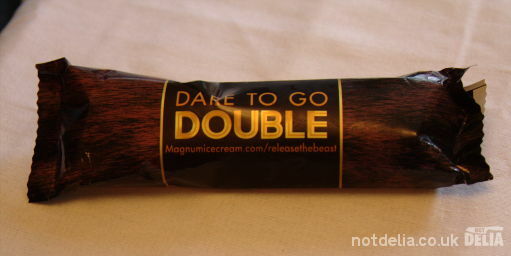 Magnum invites ice cream fans to unleash their wild side, release their inner beast and ‘Dare to go Double’ by awaking their senses with a combination of flavours and textures. Enjoyable though the new peanut butter flavour was, I couldn’t really have described it in those terms. It was a pleasant ice cream, and I would happily eat it again if someone gave me one. By all means try it if you get the chance, it’s very good. But if I fancied a luxury ice cream I probably wouldn’t buy this. I’d go for the Magnum classic or maybe even the almond one, which I was rather partial to when we lived in South East Asia. Ah well, there are still some mini Magnums in our freezer, some with flavours we have yet to try. The Magnum Doubles range can be found in all major retailers from March 2016 onwards and purchased as either a single or multipack, and available also in Mini size. Bursting on the scene, Magnum Double Peanut Butter is the perfect taste combination of sweet and salty for a rich flavour experience. Velvety smooth peanut-butter flavour ice cream is dipped in chocolate flavour coating, smothered in a layer of peanut butter sauce and covered in famous cracking Magnum chocolate, made from high quality cocoa beans. Velvety smooth chocolate ice cream covered in chocolate flavour coating, layered in a luscious chocolate sauce, made using an extra dose of premium Magnum chocolate, and wrapped with the famous cracking Magnum chocolate for the ultimate chocolate-lover’s experience. Featuring a rich caramel sauce, Magnum Double Caramel is an intense twist on the beloved classic. Velvety smooth vanilla ice cream is dipped in a chocolatey coating, layered with caramel sauce and wrapped in premium cracking Magnum chocolate.